Newspaper article in the The Sanford Herald on the leasing of nearly half of the stall at the Sanford State Farmers' Market within days of opening. The Sanford State Farmers' Market, located at 1300 South French Avenue, was founded in 1934 in order to provide a central location in which farmers would sell their produce directly to consumers. The idea for the Sanford State Farmers' Market was devised by Fred Dorner and Gus Schmach, both members of the Seminole Agricultural Club. Sanford Chamber of Commerce president Harry Papworth also contributed to the development of the market. The Federal Emergency Relief Administration (FERA) authorized construction plans on June 11, 1934. On June 20, 1934, the City of Sanford donated a portion of the Alex V. French properties to the State Marketing Board, which selected the northwest corner of French Avenue and Thirteenth Street. The board approved the installation of telegraph and telephone equipment, as well as a three-pump filling station. The Sanford State Farmer's Market opened on December 18, 1934. By 1939, the Farmers' Market was bringing a total volume of business of $627,065.81. In 1941, business volume reached over $700,000. On April 4, 1957, a fire destroyed the building and caused damages estimated at $2.5 million. Reconstruction began almost immediately and the Farmers' Market was expected to re-open by the fall of 1957. In 1991, plans were created to restore, preserve, and convert the citrus packing house into a museum. 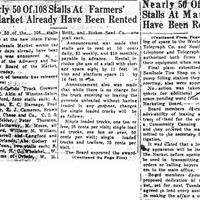 Photocopy of original newspaper article: "Nearly 50 of 108 Stalls at Farmers' Market Already Have Been Rented." 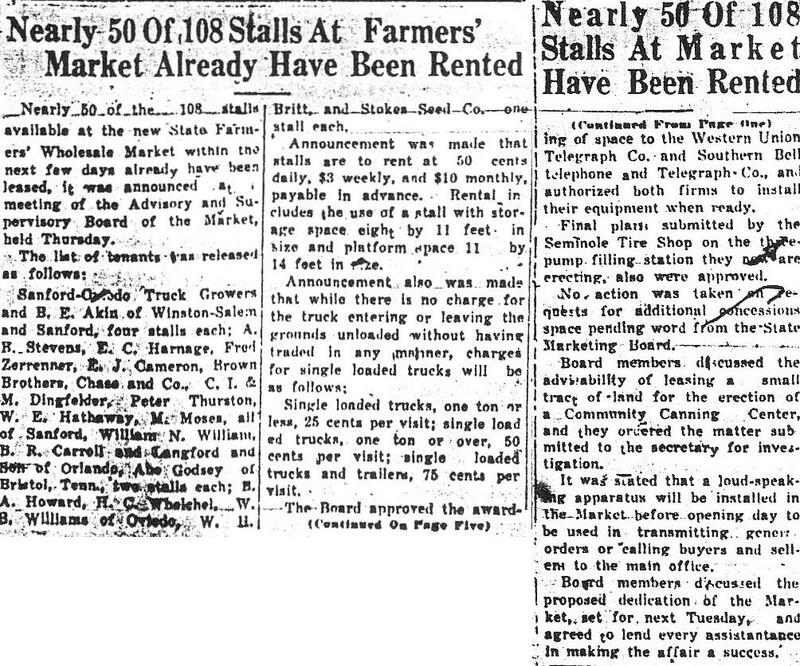 The Sanford Herald, December 14, 1934, pages 1 and 5: State Farmers' Market Collection, Museum of Seminole County History, Sanford, Florida. Original newspaper article: "Nearly 50 of 108 Stalls at Farmers' Market Already Have Been Rented." The Sanford Herald, December 14, 1934, pages 1 and 5. Digital reproduction of photocopied newspaper article: "Nearly 50 of 108 Stalls at Farmers' Market Already Have Been Rented." The Sanford Herald, December 14, 1934, pages 1 and 5. The Sanford Herald, December 14, 1934, pages 1 and 5. Nearly 50 of the 108 stalls available at the new State Farmers' Wholesale Market within the next few days have already been leased, it was announced at meeting of the Advisory and Supervisory Board of the Market, held Thursday. Sanford-Oviedo Truck Growers and B. E. Akin of Winston-Salem and Sanford, four stalls each; A. B. Stevens, E. C. Harnage, Fred Zerrenner, E. J. Cameron, Brown Brothers, Chase and Co., C. I. & M. Dingfelder, Peter Thurston, W. E. Hathaway, M. Moses, all of Sanford, William N. William, B. R. Carroll and Langford and Son of Orlando, Abe Godsey of Bristol, Tenn., two stalls each; B. A. Howard, H. C. Wholehel, W. B. Williams of Oviedo, W. H. Britt, and Stokes Seed Co. one stall each. Announcement was made that stalls are to rent at 50 cents daily, $3 weekly, and $10 monthly, payable in advance. Rental includes the use of a stall with storage space wight by 11 feet in size and platform space 11 by 14 feet in size. Single loaded trucks, one ton or less, 25 cents per visit; single loaded trucks, one ton or over, 50 cents per visit; single loaded trucks and trailers, 75 cents per visit. The Board approved the awarding of space to the Western union Telegraph Co. and Southern Bell telephone and Telegraph Co., and authorized both firms to install their equipment when ready. Final plans submitted by the SEminole Tire Shop on the three[?] pump filling station they now are erecting, also were approved. No action was taken on requests for additional concessions space pending work from the State Marketing Board. Board members discussed the availability of leasing a small tract of land for the erection of a Community Canning Center, and they ordered the matter submitted to the secretary for investigation. It was stated that a loud-speaking apparatus will be installed in the Market before opening day to be used in transmitting general[?] orders or calling buyers and sellers[?] to the main office. Board members discussed the proposed dedication of the Market, set for next Tuesday, and agreed to lend every assistantance in making the affair a success. “Nearly 50 of 108 Stalls at Farmers' Market Already Have Been Rented.” RICHES of Central Florida accessed April 26, 2019, https://richesmi.cah.ucf.edu/omeka/items/show/1161.